This is pretty cool - wish I'd had one about a year ago, when we visited Haunama Bay on Oahu! 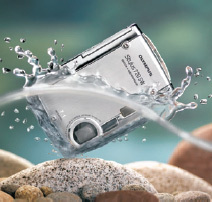 I know some of the older digital cameras (like my Canon S30) had waterproof housings you could buy, but they weren't exactly cheap - not really practical for something you'd use maybe once. And if you want one for a DSLR - Nikon D70 for instance - it costs more than the camera!